Police responded around 9:53 a.m. Saturday to the area of 18 Nourse Street for a serious motor vehicle crash. One person was killed Saturday in a two-car crash in Westborough, Massachusetts. Police responded around 9:53 a.m. to the area of 18 Nourse Street for a serious motor vehicle crash. Upon arrival, officers observed two cars were involved and one occupant was trapped. Firefighters extricated the trapped driver using hydraulic tools. He was transported to UMass Memorial with life-threatening injuries and was later pronounced dead. His identity is being withheld pending family notification. 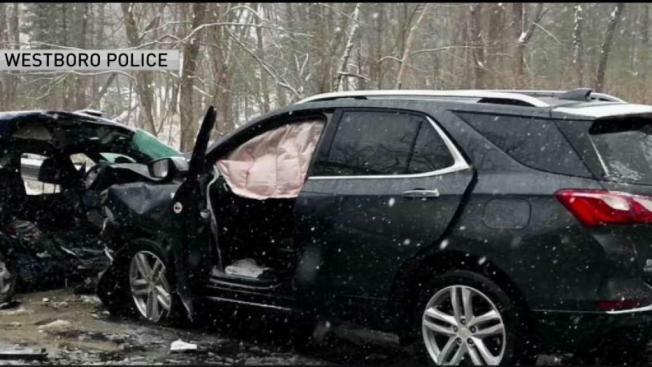 The second person involved, Tracey Lowney, of Saugus, was driving a gray 2019 Chevrolet Equinox. She was taken to UMass Memorial with non-life threatening injuries. Officials say her vehicle suffered heavy front end damage. Nourse Street near Old nourse Street was closed following the crash for an investigation. It has since reopened.